Keeping your wheels in alignment keeps your tires from wearing unevenly, which is important for overall tire health. When wheels are out of alignment, your car may drift and pull in either direction while driving straight. On the other hand, uneven tire wear can cause wheel misalignment, in which case you’ll likely want to get a tire rotation and wheel alignment. Getting your tires rotated allows the tires to wear evenly, meaning they will be less likely to cause wheel misalignment. Regular tire rotation will keep your tires healthy longer because it will ensure even tire wear. Tires get worn out. It’s important to replace them, because without doing so you risk your safety and the safety of others. Worn out tires can cause the car to slip or skid in foul weather conditions, or cause you to lose control even in normal driving conditions. Worn out tires are especially dangerous for high speed driving because they are much more likely to fail and cause a dangerous accident. 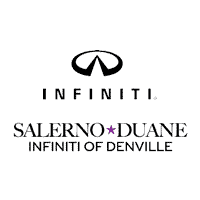 When you come in for regular maintenance at Salerno Duane INFINITI, we’ll check out your tires for several signals that it’s time to replace your tires. If the sidewall of your tires are cracked, blistered, or swelling, the integrity of the tire has been compromised. This can be caused by uneven or low tire pressure, or it could be tire failure due to tire malfunction. Tire sidewalls should be uniform all the way around and free of any visible blemishes. The tread should be no less than 1/16 of an inch, according to most standards,. But we’ll check your owner’s manual to be sure. Most tires have a white line to indicate that the tread is getting too low. Driving on bald tires means they don’t have as much traction and can cause the car to slip or skid more easily. There shouldn’t be any nails or screws in your tire. If there are, we might be able to plug it. If the hole is too close to the sidewall, we’ll have to replace the tire completely. Driving with a damaged tire can lead to dangerous consequences from a simple flat tire to a sidewall blow-out. Maintaining proper air pressure is key to maintaining tire health. Not only does it ensure even tire wear, it also keeps your wheels in alignment.